Microsoft’s Surface Studio was one of the worst kept secrets in technology in the latter half of 2016 (and also the recent victim of an iFixit teardown). The optional Surface Dial accessory, however, took virtually everyone by surprise (in a good way). Many were also surprised (again, in a good way) by how easy it is to repair the all-in-one. Will the Surface Dial follow in the footsteps of its companion and prove to be equally as easy to dissect and repair? For that answer, we once again turn to iFixit. Jumping right in, the team found that the rubber foot on the bottom of the Surface Dial is held in place by magnets and thus, comes off without a fight. 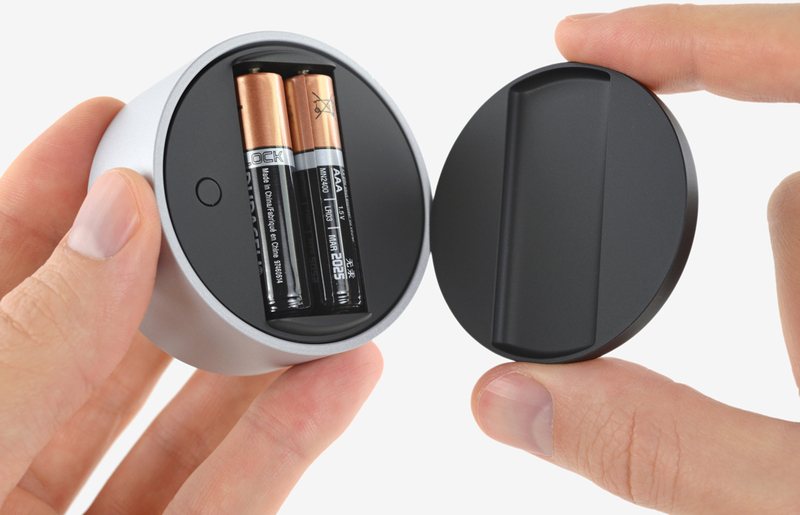 It is here that you’ll find two AAA batteries and a sync button (this explains why it’s so easy to get the cover off). Going deeper, however, requires a bit more work (and some tools). After struggling to get the mid-frame / battery compartment out, the team found a single access hole as part of the spinning mechanism that must be used to remove a few screws that separate the body from the silver cover. Only after the fact did they find a plugged hole under the battery compartment that would have made removal a bit easier. As such, they recommend drilling through the plug to remove the screws that separate the body. Back on track, they get the internals separated from the outer casing and have to pop the bearing apart to advance further. The team encounters springy posts that help even out the pressure when you press down on the Surface Dial, a pancake vibration motor for force feedback and a microswitch responsible for its click functionality. Also of note is the component responsible for the “spinny” function which iFixit says looks very similar to the sensor inside the Nest thermostat. Overall, iFixit awarded the Surface Dial a repairability score of four out of 10 (the higher the number, the easier it is to repair) which is one point less than the Surface Studio. iFixit praised the dial for its easy-to-remove bottom panel that makes swapping batteries and syncing a breeze. The team noted that while the accessory is durable, repairs are unlikely as most of the components that would probably fail can’t be replaced without damaging other parts. The vibrating motor responsible for haptic feedback, for example, is firmly held in place with strong glue. Without a repair guide and enough courage to drill your way into the main compartment, you won’t even get the chance to service anything. Given its sub-$100 price tag, your best bet is to either try and replace a faulty dial under warranty or simply buy a new one.